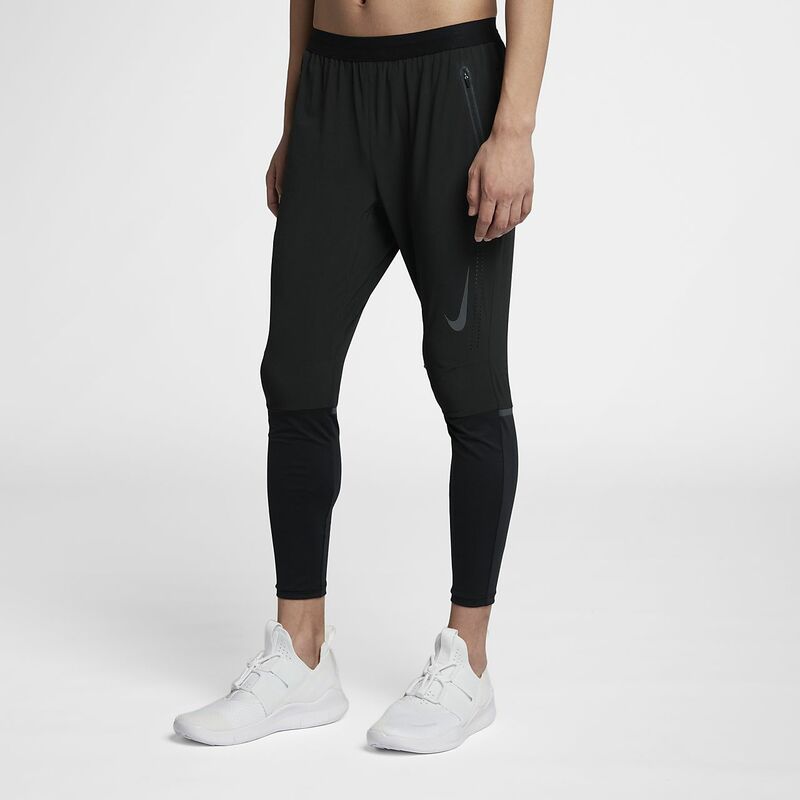 American distance runner Galen Rupp helped design the Nike Swift Men's Running Trousers to serve as a fast warm-up piece you never have to take off. They are less revealing than tights, but are still built to perform when you hit your stride. American distance runner Galen Rupp helped design the Nike Swift Men&apos;s Running Trousers to serve as a fast warm-up piece you never have to take off. They are less revealing than tights, but are still built to perform when you hit your stride. Nike Flex fabric stretches with your body for comfort before, during and after a run. The standard fit up top feels less exposed than tights, while the tapered fit from knee to ankle prevents the cuffs from flapping as you pick up speed. Dri-FIT Technology moves sweat away from the skin to the surface of the fabric, where it evaporates quickly, while perforations in high-heat zones help keep you dry. A pocket on the back of the right hip can fit a phone, and it has a vapour barrier to help keep sweat out. Zip side pockets store small items like keys, cards or cash during your run or afterwards. Fabric: Body: 80% polyester/20% elastane. Panels: 85% polyester/15% elastane. Have your say. Be the first to review the Nike Swift.